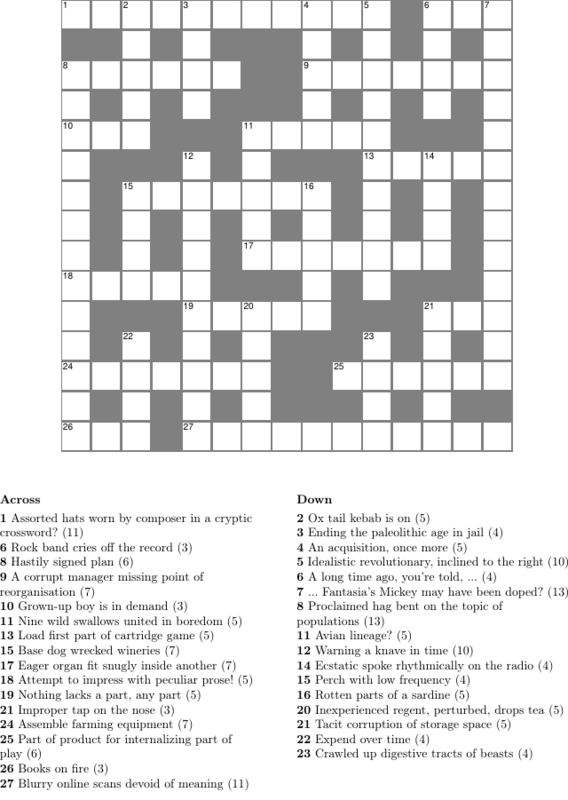 I've composed another cryptic crossword. Admittedly, the grid layout leaves something to be desired, but I'm rather proud of some of the clues. Please enjoy responsibly! The clues in a cryptic crossword appear to be English phrases. However, don't let that fool you: The so called surface of a clue is only for show, and is unrelated to the word you are looking for. Instead, you must figure out a way to decipher the clue according to an established set of rules, in such a way that the correct answer is implied in two different ways. Comments are disabled for this page. At some point, you could head over to the solution page which contains spoilers (and allows comments). But don't do it too early.